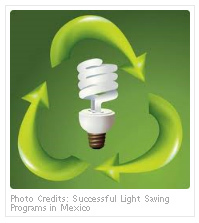 Mexico’s President Felipe Calderón handed out the sixth millionth energy saving light bulb as part of his administration’s Sustainable Light Program. The purpose of this program, said the president, is to combat climate change by reducing energy consumption. He added that the severe drought in the north of the country, coupled with the recent abnormal floods in Tabasco, reflect the gravity of the phenomenon. He explained that the electricity derived from fossil fuels produces greenhouse gases. In order to mitigate the effects of global warming, the Sustainable Electricity Program, the most ambitious of its kind worldwide, was launched in July. As a result of this program, nearly 23 million incandescent bulbs will be replaced by energy-saving bulbs by the end of 2011, benefiting six million households. To date, approximately one and a half million households have replaced their bulbs. The president explained that the program will benefit families, by reducing their utility bills, since they will use 75% less energy, the country, since replacing these bulbs will save the Mexican federal government nearly 2.35 million pesos in electricity subsidies, and help the overall environment. In addition to reducing electricity generation, the program will also reduce greenhouse gas emissions. President Calderón stated that the “Trade in Your Old One” program, as well as the green mortgages program, granted through INFONAVIT, complement efforts to reduce energy consumption. Nearly 26% of the energy consumed in Mexico is now obtained from renewable sources. In order to receive up to four energy-saving bulbs, citizens must simply take four old light bulbs to a trade-in center, together with a utility bill, official identification or proof of residence.